Jessica has been a great show beast in her time. She was Junior Champion at Balmoral Show, twice second at The Royal Show, and breed Champion at Surrey County, amongst many other successes. She also visited 10 Downing Street during the BSE crisis! H. Rumsden Pirouette born Feb 1999 by Blelack Corporal - sold 2004 to Graywood Charolais. Pirouette bred Rumsden Ultra who was 2nd at the Royal Show in 2004. H. Rumsden Reveille born June 2000 by Rumsden Newcastle - Slaughtered due to injury. B. Rumsden Supersonic born June 2001 by Simpsons Gregg). 2nd at Kent County his only show in 2002. Sold for dairy cows. B. Rumsden Uboat born July 2003 by Doonally Prince - 2nd at Perth in Feb 2005. Sold to Orkney for 2,000gns. 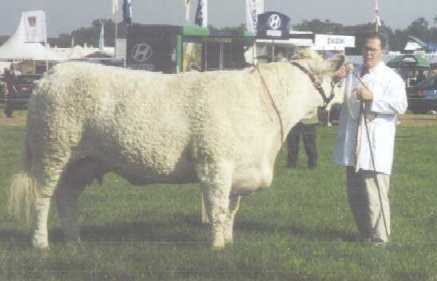 Lendor Jessica at Kent Show in 2002 aged 8 years old.